Tom DiMaria attended Quincy College as a goalie and was an NAIA Champion along with being a two time member of the NAIA All-Tournament team. Tom was the 1970 MVP for Quincy and had 31 Shut outs while at Quincy. 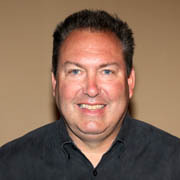 Returning to St. Louis, Tom was a member of the Midwest Olympic pool, Tom played for St. Barts league champions and then found him moving from the Quincy team, to Busch, Imos, Our Lady of Sorrows, the Kutis Collegians Amateur Cup Champions and the Frogs S.C.
Tom went on to coach Harris Stowe on the college level and Scott-Gallagher and Busch S.C. at the club level. 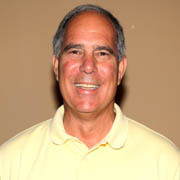 Tom’s teams won a number of SLYSA, Mid-West, and State Championships. On the high school level, Tom coached at Ritenour High School. Tom also had time to be a college referee for 16 years. 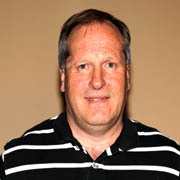 Paul Dueker began his adult soccer career with Meramec Community College from 1973-1974, and was named 2nd team All-American by the National Junior College Athletic Association. Subsequent to his career at Meramec, he moved on to Akron University to complete his college soccer career. Duke further progressed his soccer career by entering the Amateur soccer arena. After a brief time with the Cleveland Cobras in the ASL, Paul played for the Cleveland Force in the MISL. 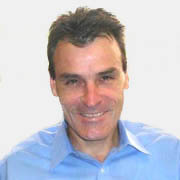 Paul later returned to St. Louis to become the keeper for Kutis S.C. where he tended the nets from the 80’s and into the 90’s, winning a National Open Cup Champion and U.S. CONCACAF appearance for Kutis, along with an Over 30 National Champions to the Kutis name. Giving back to the game, Paul began officiating in 2001 for the Catholic Youth Council, before beginning to officiate high school soccer for 14 years, and college soccer for seven years. Paul was inducted into the U.S. Adult Soccer Association Hall of Fame in 2006. John Garland a Junior College All-American for Florissant Valley National Champions and an NCAA All- American for the University of Missouri-St. Louis gaining and invitation to play in the Senior Bowl. John played his amateur soccer for Kutis S.C. and Busch S.C. and the Budweiser Over-30 winning league championships and U.S. Amateur Cup for Busch and two Over 30 U.S. Championships for Budweiser. John played his two year professional career for the St. Louis Stars. Janice Gettemeyer Sansone is a three time All-American at UMSL, her college years included a 4th place in the AIAW Division before UMSL moved to the NCAA and a 4th place finish in their tournament. Jan was a yearly All-Conference, All-Midwest, All Region, and All Tournament MVP. After college, Jan began her amateur playing for Soccer Dome, Royal Midtown Chrysler, and the Busch Soccer Club where the team appeared in 4 Final Four USSF Amateur Championships. After playing Jan began a career in refereeing. As successful as she was at playing her accomplishment as a referee will never be matched since she was the first in so many categories. Beginning in 1977 in the CYC, Jan began USSF games in 83, College in 85, 92 the first NPSL assistant, 95 FIFA Panel of International Lineswomen, 97 FIFA Panel of International Referees, numerous High School District and State Finals, and USSF highlights include Missouri Cup and Olympic Festival games. On College, NAIA, MCA, NJCAA, JUCO, and NCAA games are every year standards. From 95-2002, Jan was a rules interpreter for Missouri High School. A 2001 Inductee into the Inaugural UMSL Hall of Fame Class. 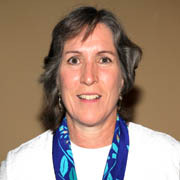 Joan Gettemeyer is a three time All-American that included 2 First Team honors and a finalist in 1981 for the Borderick Award for outstanding female collegiate athlete that spans all athletic categories. Joan was team captain for UMSL throughout her college career. This leadership was awarded by being named to a number of All- District and All -Tournament teams. Joan was the UMSL team MVP for 3 years along with being awarded the UMSL Female Athletic of the Year. Joan began playing outside of college for Soccer Dome, Royal Midtown Chrysler s, Club Irish and Busch Soccer Club. While on these teams, Joan appeared as a member of 4 Final Four National Amateur Championships. Joan also was a member of the Olympic Festival Team. 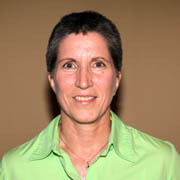 Joan was inducted into the UMSL Hall of Fame in 2004. 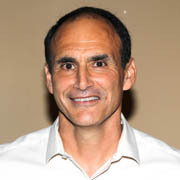 Tom Groark was a member of the SIU Edwardsville NCAA Division I National Champions where he received All-American honors twice in his college career. Tom was a member of Gaffneys, Busch, and Kutis Soccer Teams and a member of the Olympic pool. With the Busch team, Tom won a US Amateur title, and being a finalist for an Amateur title another year while winning a National Open Cup under the Busch banner. As a Kutis SC player, the team landed an Open Cup Final and as a Kutis O-30 team member won the National O-30 Championship. On the professional scene, Tom was drafted out of high school by the Minnesota Kicks and after college the Chicago Sting. Tom then landed in Ft. Lauderdale with the Strikers, Carolina Lightnin’ and back to Ft. Lauderdale to play with the Sun winning a USL Championship. 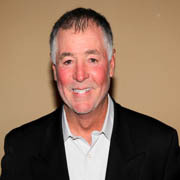 Tom was inducted into the SIUE Athletics Hall of Fame in 2012. His Dad, also Tom Groark, was inducted into the St. Louis Soccer Hall of Fame in 1990. Bob Radice began his senior career as a member of the National U-19 Team while committing to attend Quincy College. Attending Quincy, Bob was a member of three NAIA National Championship Teams while receiving honors for MVP, Most Outstanding Offensive Player and National and All-Tournament teams. Bob played for a number of amateur teams. From Pasta House, Kutis, Mastercraft, Ziegenhein, Malles, St.Ambrose, Kutis O-30, St. Louis Flyers, and Biggies with National recognition going to a Kutis with a MO Open cup and Kutis O-30 National final. As a member of Ziegenhein a MO Amateur title, and as St. Ambrose US Regional Amateur winner as a player/coach. Throughout Gene Silberberg’s playing career, he was always a defender playing for some of the great teams of the late 40’s and 50’s. The El Reys, Brehenys, Sullivans, and Hoppe soccer clubs were a few of the clubs that won league and state titles. Gene’s illustrious career started as a 17 year old playing for the Steamfitters and receiving an invitation to represent St. Louis at the Olympic Trials in Chicago as one of two full backs, the other was Bob Annis. It was immediately followed by a trip to New York for final selection of the 48 Olympic Team, only to have the coaching staff shift Charlie Columbo to the back line. Needless to say, this was the molding of the Olympic Team of 48 and the World Cup Team of 50. After the final selection, Gene enlisted in the service at age 20, to serve in the Korean War. 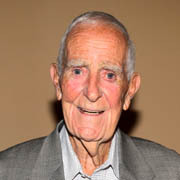 On returning from service in 1953, Gene was selected by the coaching staff to replace an injured Charlie Columbo for the 54 Olympic Team trials with Harry Keough as the other St. Louis full back. 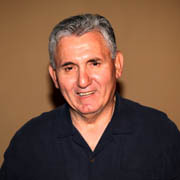 Gene still remembers his last competitive game at Carondelet lower field, where his foot was caught in a hole while shooting, and tore his knee so bad, he was never able to play again. After his playing career ended, Tim began his coaching career. Coaching Missouri Baptist College, Visitation, Villa Duschene, and Lafayette High School, Tim also was the Assistant for the St. Louis Ambush and St. Louis Steamers. 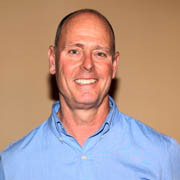 A three time Missouri High School Coach of the year, Tim received the Jimmy Dunn High School Coach of the Year in 2008 and was inducted into the Missouri High School Coaches Hall of Fame in 2014.